Dry eyes are a common problem in bulldogs. 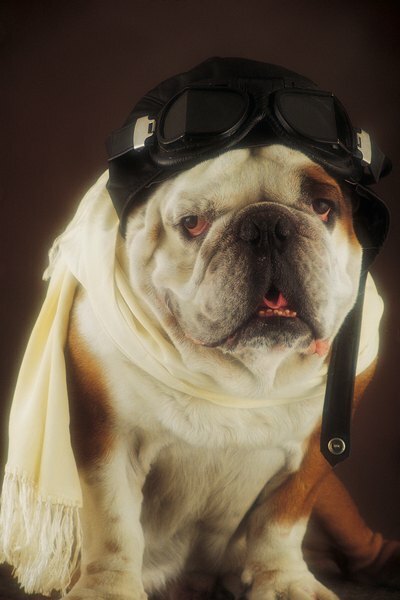 When you love a bulldog, those familiar grunts, snorts and groans become endearing. Even nightly snoring can become familiar and comforting. Unfortunately, these are signs of inherited health problems, along with goop-filled or milky eyes, sneezing and scratching. Even laziness may be a sign that your bulldog isn't breathing well. Your bulldog's adorable squishy face can cause him severe breathing problems. This is known as brachycephalic syndrome. It usually includes an elongated soft palate, narrow trachea, narrow nostrils and a tissue blockage in the throat. All of these combine to make it difficult for your bulldog to breathe normally. Hot conditions, exercise and excitement can make the problem worse. On top of that, bulldogs are prone to inhalant allergies, which cause irritation in your dog's airways, making it even more difficult to breathe. All those folds of skin on your little buddy create problems of their own. Dirt, oil, moisture and bacteria build up in the creases, leading to hair loss and infection. You can head it off by cleaning between the folds, especially on his face and at the base of his tail. Your bulldog is prone to skin allergies as well, which is easy to recognize when he scratches, rubs and chews his skin. Luxating patellas and hip dysplasia, or bad knees and hips, come with the territory for many bulldogs. A little bit of extra weight, which most bulldogs pack on easily, makes it even worse. These conditions are inherited and unavoidable in many dogs, even those at a healthy weight. This is in part due to the bulldog's body shape and in part to irresponsible breeding. A dog with either of these issues should not be allowed to reproduce and pass on these skeletal problems to the next generation. Those cute wrinkles don't just cause skin problems, but pull down the bottoms of your bulldog's eyes. They end up constantly dry and irritated. You may need to put in drops several times a day to keep them moist. Your bulldog is also at risk for cherry eye, which means that the gland in the corner of his eye pokes out from under the eyelid. This usually will require surgical correction. Other common eye problems include blocked tear ducts and turned-in eyelashes. If any of these conditions cause damage to your dog's cornea, he could become blind.